As it swooped past the south pole of Saturn’s moon Enceladus on July 14, 2005, Cassini acquired high resolution views of this puzzling ice world. 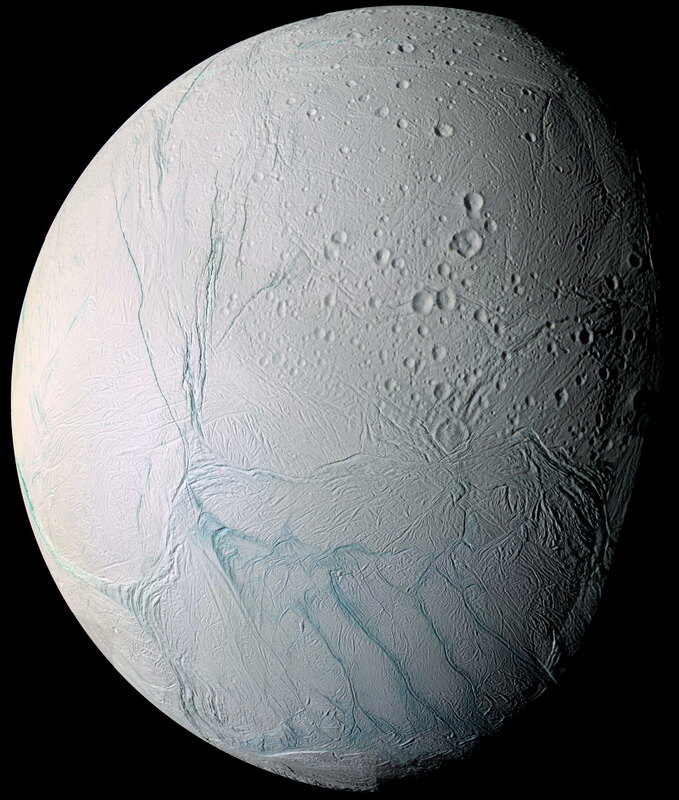 From afar, Enceladus exhibits a bizarre mixture of softened craters and complex, fractured terrains. This large mosaic of 21 narrow-angle camera images have been arranged to provide a full-disk view of the anti-Saturn hemisphere on Enceladus. This mosaic is a false-color view that includes images taken at wavelengths from the ultraviolet to the infrared portion of the spectrum, and is similar to another, lower resolution false-color view obtained during the flyby (see PIA06249). In false-color, many long fractures on Enceladus exhibit a pronounced difference in color (represented here in blue) from the surrounding terrain. A leading explanation for the difference in color is that the walls of the fractures expose outcrops of coarse-grained ice that are free of the powdery surface materials that mantle flat-lying surfaces. The original images in the false-color mosaic range in resolution from 350 to 67 meters (1,148 to 220 feet) per pixel and were taken at distances ranging from 61,300 to 11,100 kilometers (38,090 to 6,897 miles) from Enceladus. The mosaic is also part of a movie sequence of images from this flyby (see PIA06253).